It is quite an odd thing to do to put a smudge of ash on our foreheads. When you look in the Bible you see that it has a rich significance and meaning. If you know your Bible you will remember that Cain and Abel were the two sons born to Adam and Eve. But that, horrifically, Cain murdered his brother. What makes it even worse is that it is a religiously motivated murder. Cain is jealous because God accepted his brother’s sacrifice but rejected his. Which is a salutary warning that in worship, it is not what we bring in our hands but what we bring in our hearts that counts. As a punishment God curses Cain and banishes him to a life of restless wandering. Cain is terrified and says that wherever he goes people will try to kill him because of his crime. But God puts a mark on Cain and this mark is both a sign of his guilt, but also a sign of God’s protection of him. Then in Ezekiel 9 we have a story that occurs when the people of God are turning their back on Him. They have abandoned God, embraced violence and vice and even set up idols in the very temple of God. Interestingly in the Hebrew it reads ‘mark with a Tav’. 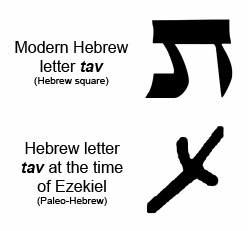 Tav was the last letter of the Hebrew alphabet and had the symbolic meaning of ‘a sign’ or a ‘mark’. In its ancient form Tav was written as an x. So 600 years before Christ, the people of God are saved by the sign of the cross on their foreheads! Then in Revelation 7 God is about to execute judgement upon the earth but before He does He sends an angel to mark the foreheads of those who serve God. And we see that as the waves of God’s judgement fall, each time we are told specifically that the people who bears God’s mark on their foreheads are kept safe. “No longer will there be any curse. The throne of God and of the Lamb will be in the city, and his servants will serve him. The mark that begins as a sign of guilt ends up as a sign of grace and forgiveness. The mark that begins as a sign of God’s curse, ends up as a sign of God’s blessing. The mark that begins as a sign of separation ends up as a sign of belonging. We receive this sign today as people who are living in the middle of this story. We’re no longer in the Old Testament, but we’re not yet in Revelation. We receive this sign looking both ways. This mark that we receive this day has something about it of the mark of Cain; it is a reminder that our lives are still far from perfect and that we are not cooperating with the Holy Spirit as fully as we might to bring about our transformation into people who resemble Jesus. Lent is a time where we are called to examine our lives in the light of our calling and the coming judgement. But we also receive this sign looking forward to the end of the story. We receive this mark as a sign of grace, as a sign of hope, as a sign that God is powerful and faithful. We receive this sign as a promise that the story ends well. We receive sign as the mark of God’s promise that He will bring us safely home.